As we drove into the pasture with a half-ton bale of hay for the cows I saw a flock of perhaps thirty small birds fly in a tight pattern away from us. 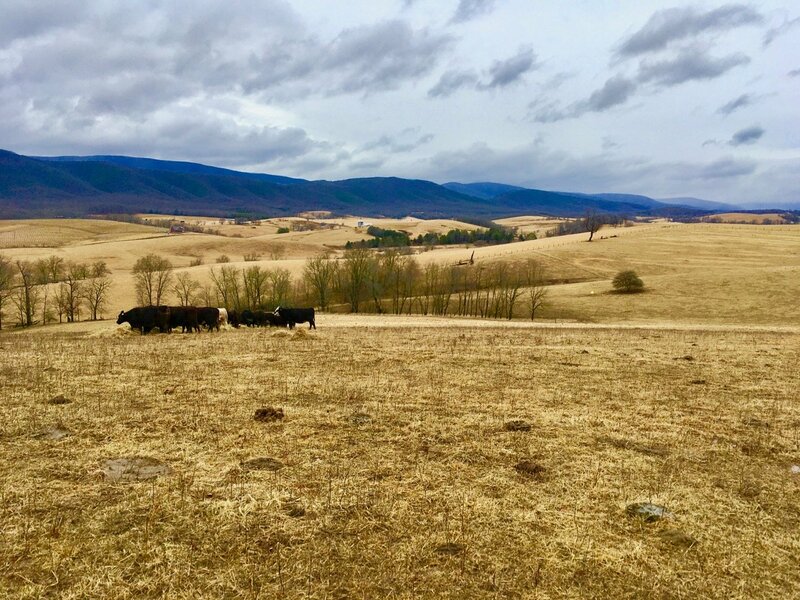 The vast grasslands of Swoope, VA. The Allegheny Mountains flank our Valley to the West. This is winter habitat for Horned Larks. The flying flock turned one way, then another, their white bellies exposed as they turned. This is a tell-tale sign of Horned Larks. They landed on the cold, brown, dormant, pasture about thirty yards away. Once they landed, I could not see them with my naked eye because they blend in so well with the vegetation. A Horned Lark on Hoffman Farm winter pasture in Swoope, VA. Photo by R. Whitescarver. I don’t think most people know what the birds are because they can’t get close enough to identify them. They’re just little birds flitting away. Put a pair of binoculars on them and you will see one of the most beautiful birds in North America. Horned Lark, photo by © Marshall Faintich. Horned Larks are grassland birds, 7 to 8 inches long, brownish on top and whitish underneath. They have a white eye-stripe, black mustache, yellow chin, and black bib. They prefer very short vegetation or bare ground and walk or run along the ground in search of seeds and insects. The vast grasslands of Swoope, Virginia, are in America’s legendary Shenandoah Valley. 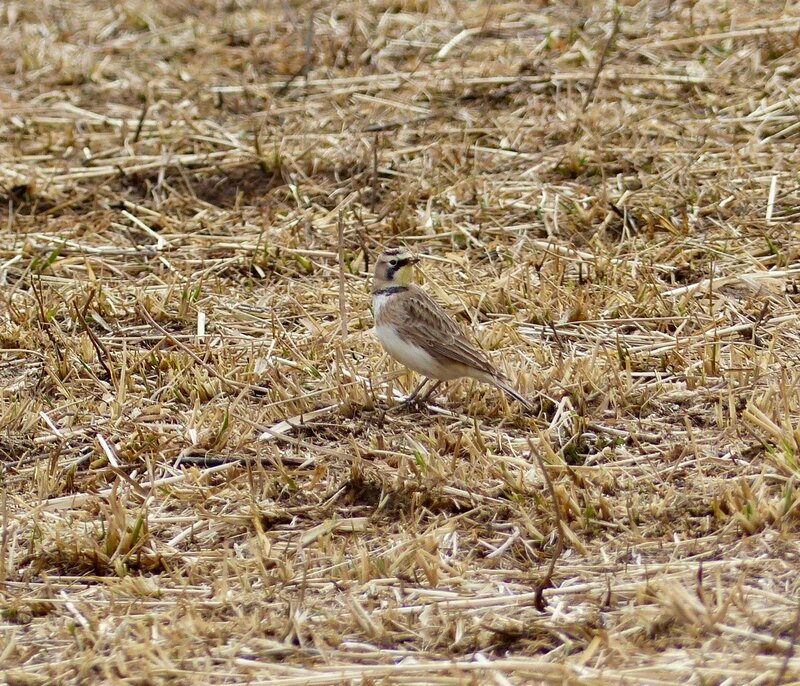 We see Horned Larks every day during the winter in fields where we feed the cows. In these fields the vegetation is short but not bare. I don’t see them in the summer on the farm because the grasses are too high for them. Sadly, this bird is a “common bird in steep decline”. 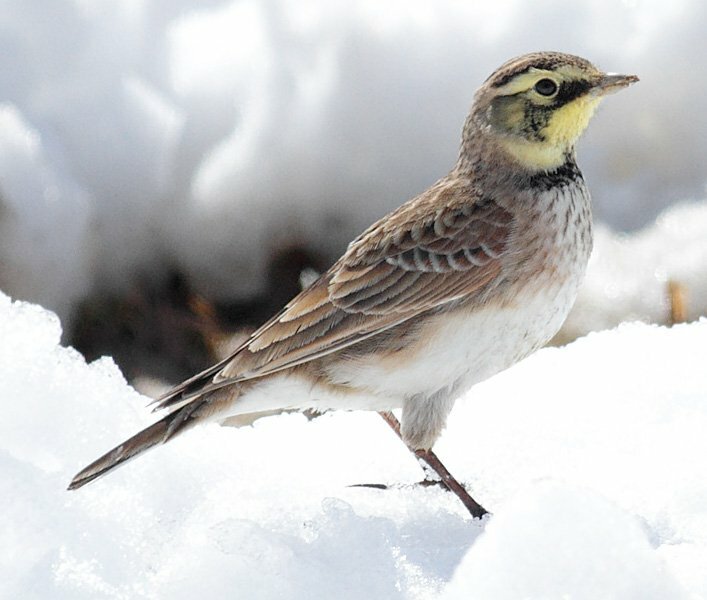 Horned Lark populations have plummetted more than 70% since 1970, according to Partners in Flight, a continental conservation organization. The reasons for the decline are all anthropogenic (human-induced) and include loss of habitat, urbanization, and pesticides. On the bright side, scientists report that the Horned Lark is a “super avoider” of collisions with towers and buildings. As you can see from the distribution map below, they are year-round residents in most of the continental US. Their breeding range extends into Canada and above the Arctic Circle. There are several ways we can help. We can support Farm Bill legislation that conserves grassland. Support local ordinances that prevent the conversion of agricultural land to non-ag uses. Keep cats indoors, and support programs that humanly trap, neuter, and shelter feral cats. Bobby, Great information. I was not aware of the bird nor its plight. I’m 72 and on my bucket list is to once more sit outside at night and hear an Eastern Whippoorwill. As a kid that was a very satisfying experience. Now probably because it’s never really quiet where I live, I have not heard one for probably 50 years. Maybe one day! Roger, thanks. Come to Swoope and we will hear the Whippoorwill. They come to the forests near hear. Whipoorwills can still be heard out 33W in the area on the right just before you begin climbing toward West Virginia. The Rockingham Bird Club has an annual summer early evening trip to an area SW of H;burg, led by an expert. Last year we heard and saw eyes of maybe a dozen whipporwills. Sometimes there is a chuckwillwidow too! Join us. There is a website where such things are advertised, you might also see a report on previous trips. Bobby – A beautiful post! It reminds me of the title of the 1971 book by Frederick George Marcham – Louis Agassiz Fuertes & the Singular Beauty of Birds. Thank you for this edition of your news from Swoope to show us all the singular beauty of birds. You are welcome, Bruce! Thanks for stopping in. A s always, really enjoyed your blog. Great to learn about a bird that I know we must have here but have not seen. However we have the feral cat problem and our area is getting heavily populated so I probably won’t see the Horned Lark on The Farm here in Georgia. George, thanks for stopping in and posting your comment. So sorry about your feral cat problem. Maybe we could bring in the Watershed Planning Team you had in Virginia to take of it. They sure got a lot done. Thank you, Bobby, for sharing information on a bird new to me. It is beautiful! And I will definitely now keep a lookout for it. Thanks, Barbara. Come on over and we’ll show them too you. In spring 2015, while doing nesting season surveys, our District’s volunteer birders and I saw one in harvested corn field that had not been replanted yet… in southern Fauquier outside of Remington. It created so much excitement amongst the birders, so your comment about them being seldom seen (or recognized anyway) is right on. I remember it clearly to this day. They are beautiful! Kris, thanks for sharing this great story! Good stuff, Bobby, as always. Last time I saw a horned lark was @ 20 years ago on my parents’ farm in Kentucky. And the last time I saw a short-eared was in, yep, Swoope. Keep Cats Indoors. Wonderful post and gorgeous images! Although Milan and I have done some birding in our area we have not see them near us. Great to learn about them and so glad you have such fine habitat to help them survive. It is sad so many species are declining. Thank you Bobby for all you do! I haven’t seen horned larks in years. Did not know they’re getting scarce. Maybe you’d better plan a field trip with a day and time we can come and look, if you don’t want company every day! My daughter works for the American Bird Conservancy and they are all very agitated about the increasing problems with feral cats–or house cats allowed to run loose. She has converted a neighbor or two, and has fewer problems feeding birds now. Congrats on another #1 award, Bobby! Anne, good the hear from you and glad your daughter works for the ABC. We are here almost every day so if you want to see them just come on by. Great article Bobby. The photo of the bird on the snow looking at the camera gave me the impression that this bird has “an attitude!” I would love to see one in Verona. At the present time at our house are so many robins that it’s hard to tell whether it’s one flock or numerous flocks. I’ve never seen this many at one time! What a beautiful bird! Would you ever expect to see this bird in urban areas? We have a lot of grass. Kristen, thanks for your comment. It’s possible, although I have never seen one in an urban area. Its’s interesting to actually know what is happening to the common animals in this case birds in the area as I feel that we really only get informed of when a rare or extremely special bird such as the Bald Eagle is in danger. Even though the place I live in Maryland is similar to that of the Shenandoah Valley I can’t say that I’ve ever seen or even heard of these beautiful birds until now and would be completely unaware of their decline. 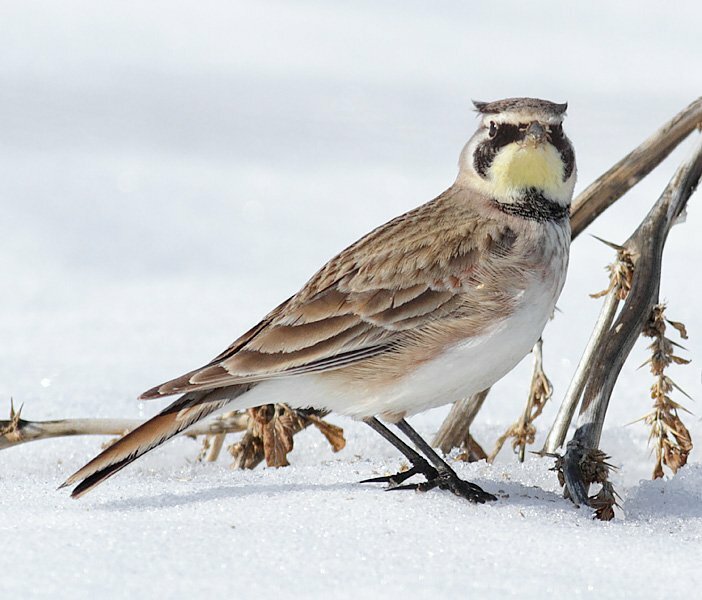 I also bet that this isn’t the only common bird that is in decline due to anthropogenic sources, and if these sources are eliminated or at the very least reduced then the Horned Lark population and other common bird populations will rebound or at least stabilize. Maybe not being from the area or not spending enough time in the right environments is why I’ve never heard of the Horn Lark. It is a unique little bird that I have never seen before. I think it is a beautiful bird and would love to see it in action. It is truly a shame that its population has decreased by 70% in the last 50 years. This is a common trend amongst the majority of bird species in the United States, unfortunately. This past summer I had a sparked interest in birds, specifically birds of prey. I was on an 18 day canoe trip in Maine and saw many different eagles, hawks, and owls during my trip. Bird watching and identifying would be a hobby I would like to pursue one day. These are some beautiful pictures you took! I have always been interested in the human-induced reasons why some species of animals are starting to go extinct. Its a truly sad and crucial factor to take into account when humans are looking to expand buildings into new environments. Research should be done to be sure that certain species won’t be directly affected by the urbanization of new areas. It seems like every day we are hearing about another species in decline because of habitat loss and changes to ecosystems as a result of human land use practices. This makes me feel like it is WE who are the species in decline since we are unable to coexist with our fellow organisms. I believe that one of the most impactful ways we could help increase the populations of the horned lark and many other ground nesting birds would be to make lawns illegal, and turn all of the lawn space in the country into meadow land, which not only supports biodiversity, but also sequesters more carbon and absorbs nutrient runoff far more effectively than a mowed lawn. In his e-book, Bobby shares his invaluable knowledge and findings drawn from years of field experience. His tips for how to improve water quality and protect livestock are a true win/win. Please read it. And please share it.